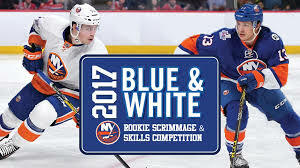 The Islanders ended up with five selections in the 2017 NHL Entry Draft as GM Garth Snow shuffled the deck a bit in light of his team’s performance in 2016-17 plus the fallout from the Expansion Draft. The Islanders dealt their first selection (15th overall) to Vegas in exchange for the Knights to take on Mikhail Grabovski’s contract. Additionally, the Isles had moved their fourth round selection in a previous draft day pick swap. 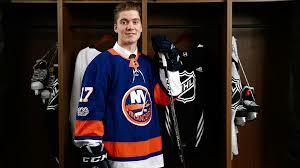 To add a pick, the Islanders swapped a 2018 sixth rounder with Los Angeles for pick number 165. The Islanders first selection in the 2017 NHL Entry Draft saw them net defenseman Robin Salo from Vaasan Sport (SM-Liiga). A late 1998 birthday, Salo has the fairly rare luxury of having an entire men’s league season under his belt before being drafted. In fact, he already has a rather buxom 74 games in Finland’s top league. In 2016-17, Salo tied for second on his club with 16 points while being the only non-minus player on the club (even). His even rating wasn’t a product of being overly-sheltered either; Salo was a 20+ minute blueliner. The young Finn plays a smart game and exhibits very strong hockey IQ. He’s a snappy passer who does a good job of getting plays off the ground, but also keeping them alive. His skating stride has some hiccups to it that could be ironed out in time. He is a capable skater and he moves pretty well laterally, but the lack of smoothness to his stride is a bit concerning for a player who is not very strong and doesn’t appear to have the upside to be notably strong going forward. He tries to battle near the net but can be overtaken by even above-average-sized forwards at any point – otherwise, he is quite aware positionally. Salo has a weak shot and is not a threat to score from most places on the rink. His NHL ETA, if applicable, is not likely to be known for another two seasons. American-born defenseman Ben Mirageas spent the 2016-17 in the USHL. He jumped from Bloomington to Chicago and helped the Steel capture their first ever championship. His ten points and plus-7 rating were both team-bests among blueliners in the playoffs. After settling in to this new surroundings, Mirageas became an integral part of the Steel’s success – the club had not made the playoffs in nine seasons. A product of Avon Old Farms, Mirageas will play one more season in the USHL before heading off to Providence College in the fall of 2018. Sturdy and armed with a terrific skating base, there is a lot of physical upside to Mirageas. He boasts a very projectable frame and is already strong on his skates. In addition to good wheels, the American defenseman shows a strong foundation for puck skills. He flashes puck carrying ability and outlet passing upside. He needs to work on his timing for delivering passes, but he is still very low on his development arc. Defensively he is generally well positioned and his smarts are above average for his level of play. There is a lot of room for growth in all aspects of his game – he is certainly a long-term project who could become a better version of Brian Dumoulin. Remarkably, Swedish Sebastian Aho (not to be confused with Carolina forward Sebastian Aho, a Finn) was passed over in the previous two drafts – and further, fell all the way into the fifth round of the 2017 Draft. The ’96 birthday will scare some scouts away with his size and his somewhat high risk style of play, but what he brings to the table is becoming more and more popular in the NHL. His fourth SHL season was really a breakthrough campaign for the 5-10 defensemen. League-wide, he finished second among defenseman in goals (10) and third among his peers in his points (30). A terrific skater with a flair for offense, Aho is no doubt an offensive defenseman. He can do almost anything on the rink from a puck skills perspective: he can outlet, he can carry, he walk the line, he can get pucks through traffic, and he can isolate defenders with and without the puck and everything in between. His shot is not overpowering, but his subtle angle change is enough to score from well out. Naturally, size and defensive ability are the potential costs for this cache of offensive weaponry. This Shayne Gostisbehere style of defenseman has NHL offensive skill right out of the box, the question becomes how well can he defend in North America? He signed an entry-level contract already and will likely come over to answer that question this fall. He is a legitimate threat to make the Islanders immediately. The Islanders continue their odd track record for selecting the bridesmaid with later picks. Durandeau, not infrequently paired with top pick Nico Hischier, joins a long line of recent draft picks who were paired up with junior stars including Mitchell Theoret (Ryan Strome), Matt Martin (Steven Stamkos), Justin DiBenedetto (Steven Stamkos) and John Persson (Ryan Nugent-Hopkins) among others. There is nothing special about the left winger’s numbers: 15 goals and 26 assists in 64 games; it showed only a mild improvement over his rookie season, in fact. There is not a lot that stands out about Durandeau’s game. He is floating around average in terms of size and his puck skills match the “average” moniker as well. He has the potential to develop a “plus” shot but he needs to improve his release. His skating shows promise, but it’s not smooth and at times looks a little clumsy. There is a lack of smoothness to his game in general that gives the impression there isn’t a lot of slack on the development arc to eat up. To date, Durandeau has been a very vanilla player in the QMJHL and his upside seems fairly limited. The Islanders last pick is spent on another diminutive forward in Logan Cockerill. The Michigan native was selected out of the USNTDP, where he had spent the previous two seasons. He also represented the United States at the U18 World Junior Championships where he helped his country claim a gold medal. Cockerill is committed to go to Boston University in the autumn of 2018. Short on size but big on speed; Cockerill is a hard worker and a very good skater. He exhibits some pop-gun offense as he darts around the sheet. This player is obviously a long-term project in every sense of the word and being listed short of 5-10 makes this a tougher climb. The foundation of skating and skill are evident but he has a long way to go before he ends up on the radar among relevant prospects. One of the Islanders top goalie prospects, Ilya Sorokin, has signed a contract extension in the KHL that will keep him in Russia through 2020. This gives Linus Soderstrom a distinct advantage at getting first crack at the Isles’ crease between now and then. In other goaltending news, the Islanders acquired Kristers Gudlevskis from Tampa Bay in exchange for Carter Verhaeghe. The Latvian goaltender has shown some degree of NHL upside, but at age 24 his prospects are fleeting. He signed a one-year, two-way deal with the Isles shortly after the trade. Redoubtable defenseman Seth Helgeson signed with the Isles as a free agent. As a late 1990 birthday, Helgeson is not at all relevant for fantasy purposes.